Now 6 months later, we have a more extensive menu, based on everyone’s feedback. 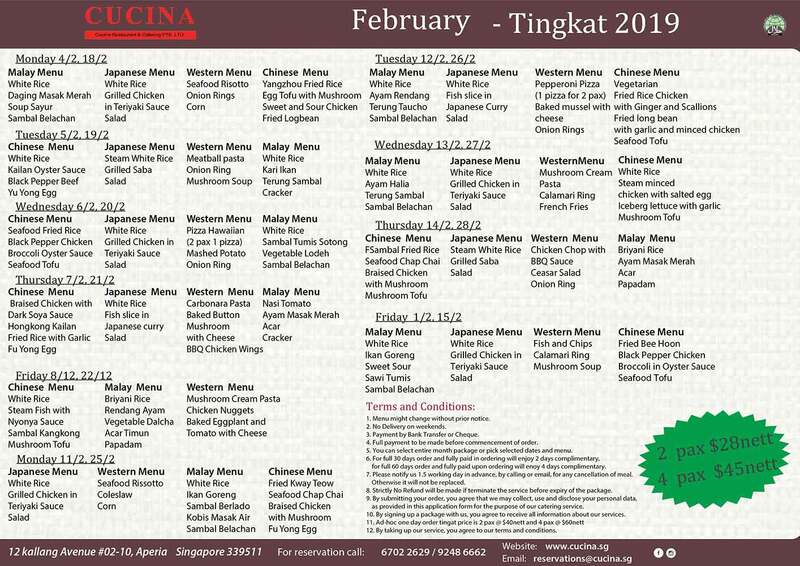 The best way for us to give back to your overwhelming support, Starting February 2019, tingkat pricing will now be $28nett for 2 pax & $45nett for 4 pax including delivery islandwide. We wish everyone a Happy New Year and may 2019 bring you good health and great wealth. 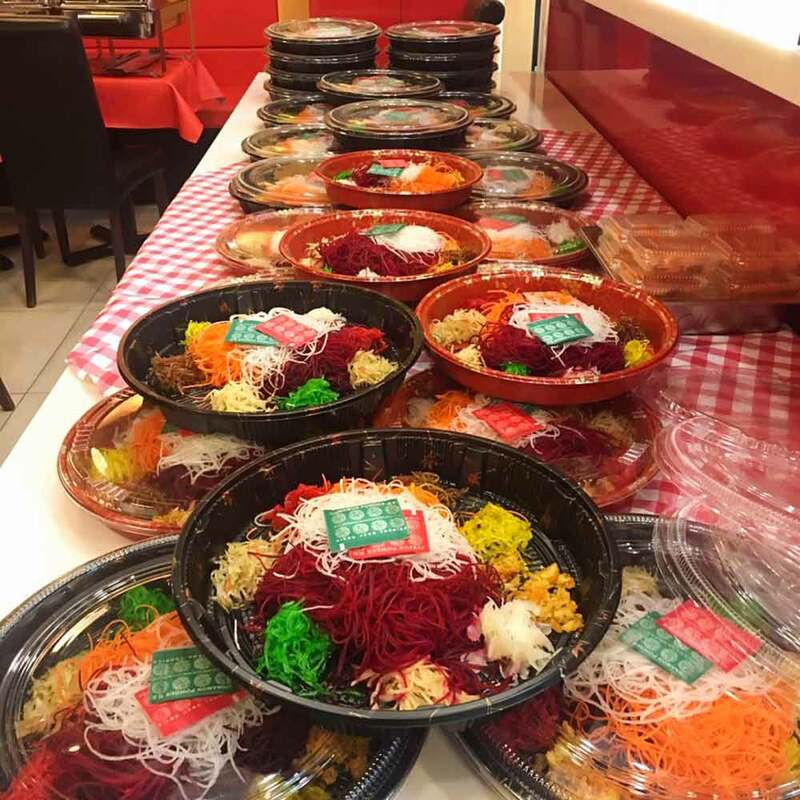 Soon it will be time for us to welcome a prosperous New Year of the Pig with Lo Hei. 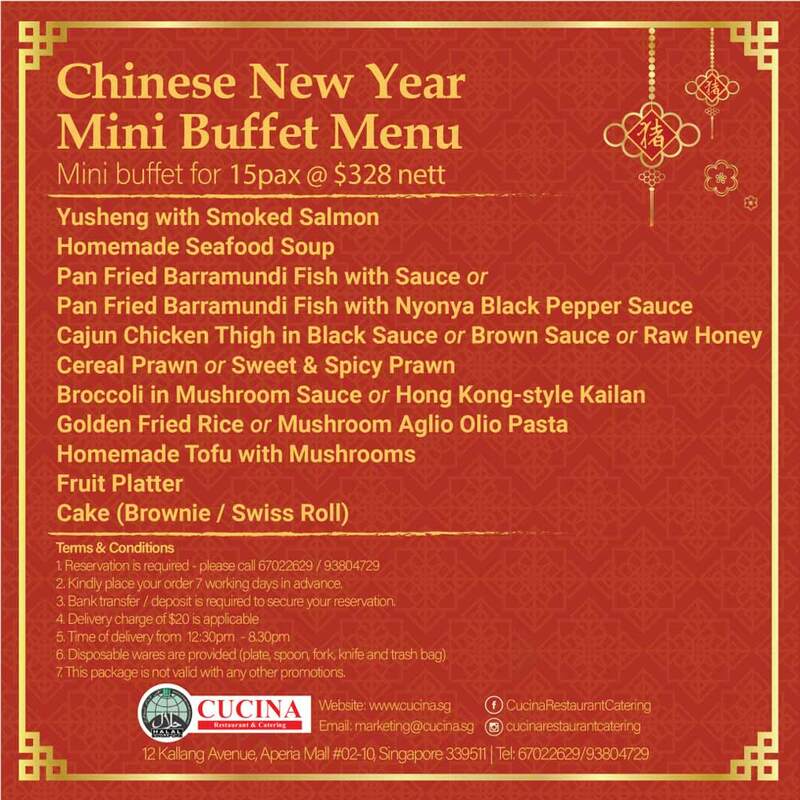 *For the vegetarian version, the smoked salmon will be replaced with beancurd. Price per set is $48+ gst and delivery charge is $15. If you haven’t, we encourage you to visit us. You get to enjoy delivery charge of only $5 when you order your food through our online shop. As a way to show our appreciation to our loyal customers, we have added 1 more vegetable dish to our Malay menu, just for this month. Thank you for supporting us through 2018, and we hope that you continue to support us this year too. Treat your family, friends, colleagues, staff or whoever else is special and left an impact on you! 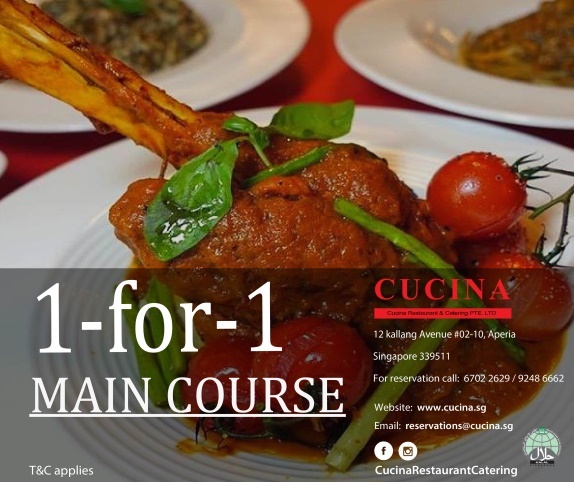 Come for dinner as a pair to enjoy our 1-Get-1 from our main course, exclusively for diners who PM us on our Facebook at https://www.facebook.com/CucinaRestaurantCatering/ with the code “Promotion”. Our 7-in-1 event and wedding package has been extended till May 2019. 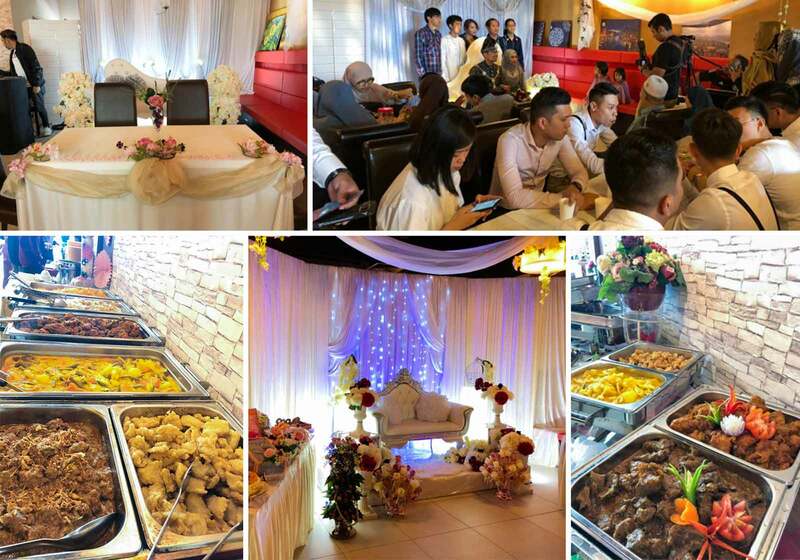 So if you’re still looking for a location for a wedding, birthday party, group celebration or whatever other event, consider our 7-in-1 event package! Use the following tag – #happinessatcucina #happinesswithdeliciousfoodatcucina – to be featured on our Facebook page and Instagram account! It’s November already? How time flies. Just felt like it was only yesterday we ushered 2018. Now we’re last 2 months in 2018. How’s everyone doing so far? Those who have kids in Primary 6, you and your kid must be feeling relieved that the PSLE is all over. Have you visited our online shop? You haven’t? We encourage you to visit us. You enjoy only $5 delivery charge when you order your food from our online shop. 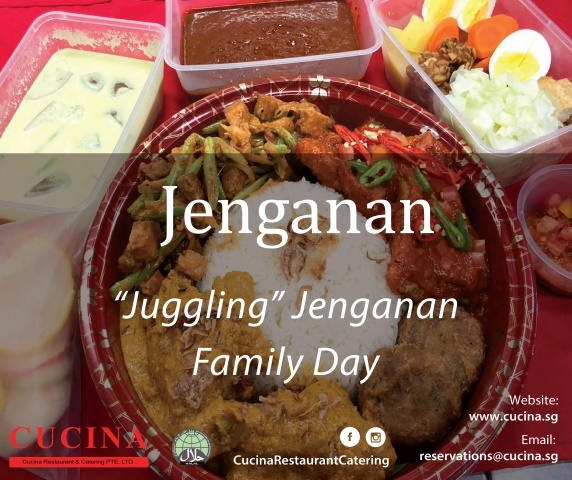 We invite you to join us every Saturday and Sunday for our Juggling Jenganan Family Day. It’s a day for the families and friends can gather, chat and gossip while feasting our Jenganan Platter. We sweeten the day with a complimentary dessert of the day just for you too. 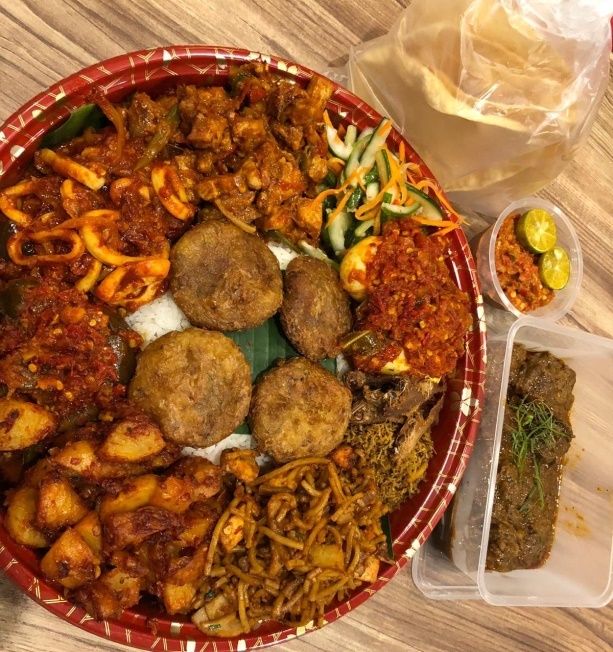 Jenganan is a traditional Javanese Cuisine, you will get to enjoy a total of 15 dishes and items in one platter – 10 dishes served together and an additional 5 items served as a mixed salad side. It is definitely a meal not to be missed! Also, we recently introduced our very own Budget Mini Buffet starting from $4, with a $5 delivery charge per address on our online store. Due to overwhelming requests, we now have Japanese dishes in our tingkat menu. It starts November 2018. 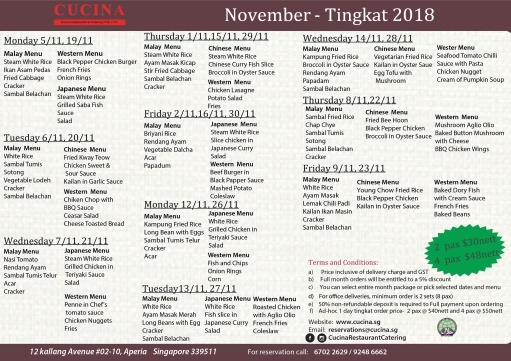 You can select 4 cuisines, (Malay, Chinese, Western and Japanese) in one tingkat menu. Can you resist enjoying our tingkat dishes while watching your favorite TV program during lunch or dinner? Wouldn’t you feel special when our Chef personally cooks and serves your dining guests? #Wetakecareofyou while you enjoy good company and great tasting delicious food exclusive by Chef Papajoh Chef on Demand dining experience. Treat your families, friends, colleagues, staffs or anyone you want to share this double treat. With the success from last year’s mini buffet package, we have decided to do it again this year. 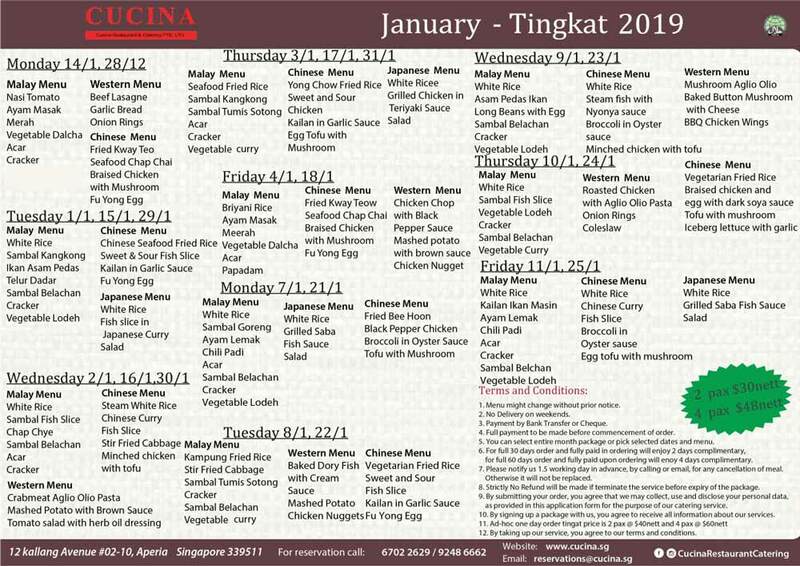 As Cucina’s VIP customers, you get an early peek for our Mini Buffet Set for Turkey or Chicken before we officially announce to the public after 15 November 2018. P.S. 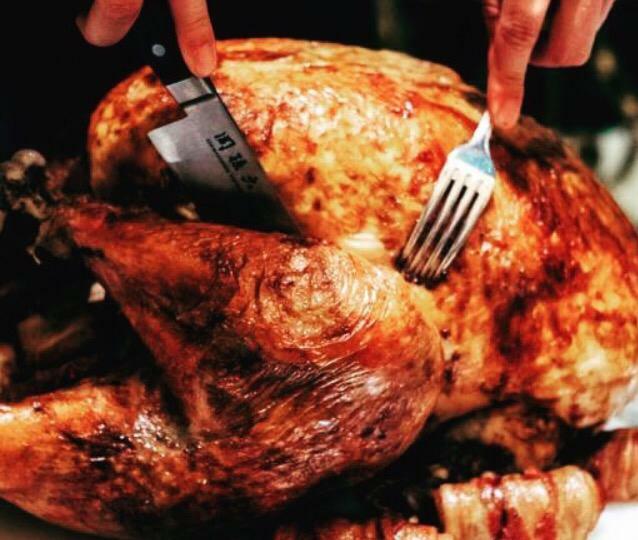 We have a limited no of ONLY 10 turkeys for this set. Please book early. Our 7-in-1 event and wedding package is still available before end 2018. So if you’re still looking for a location for a wedding, having a birthday party, planning to have a group celebration of the coming end-of-year festivities or whatever other event, take advantage of our 7-in-1 event package! We are pleased to announce to you the launch of our newsletter! Starting this October, the newsletter will be a way for you to be kept informed of what’s happening at our restaurant. Our online shop for home deliveries and takeaways recently launched and we are so excited! With our new online shop, ordering from us is now as convenient as being just a click away. 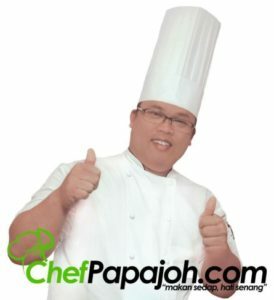 In September, we welcomed Chef Papajoh as our new team member. Starting out as a self-taught, home-based Chef, he quickly became a ‘celebrity’ after posting and sharing his recipes on social media. 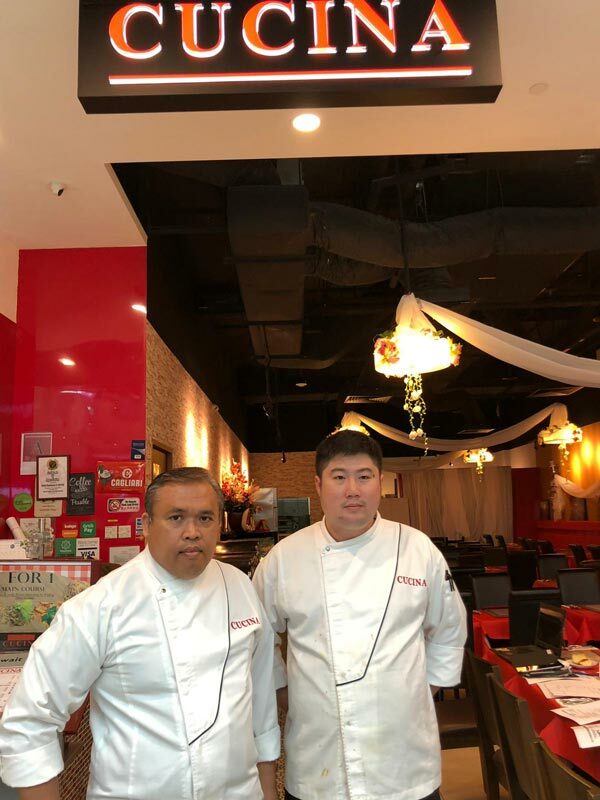 Specializing in several Asian, Mediterranean, Western and Italian dishes, he has gathered over 20,000 followers on Facebook and Instagram under the handle, “ChefPapajoh”. 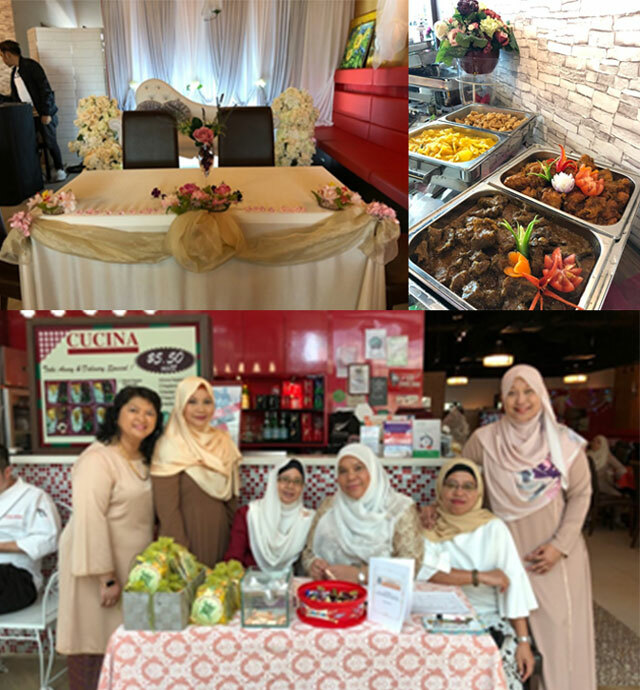 You can also arrange to have a private event with Chef Papajoh cooking exclusively for you and your guests at our restaurant or at your place. October is a busy period for exams preparations and studying. As parents, we will also be busy helping out and supporting our children. So we decided to offer to free some time for you from your daily cooking so that you can focus more on your children. 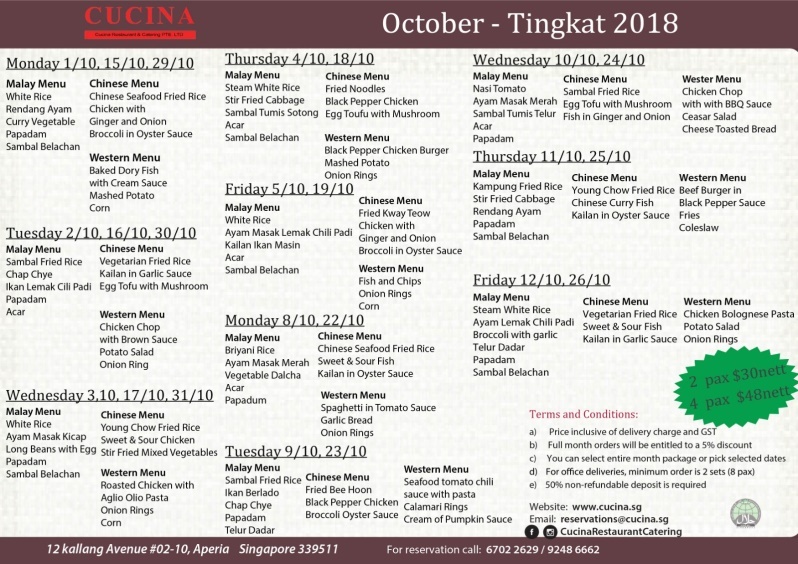 The October Tingkat menu now includes some children’s favourites while still maintaining a wide selection of Malay, Chinese and Western dishes. As usual, you are free to choose the cuisine for each day. 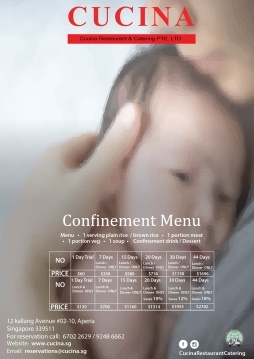 We have been receiving numerous requests for a confinement menu for new mothers. As a response, we decided to come up with a menu that focuses not only on the nutritional benefits of the meal, but taste as well. You may choose from a menu of either lunch or dinner, or a menu with both lunch and dinner. Additionally, you are free to set the duration of your package based on your needs. It’s been a year since we launched our Ambeng Platter. It has gained so much popularity that our Ambeng Platter sold out in advance more often than we expected! To keep our Ambeng Platter exciting, we have released a new menu of 14 dishes that we guarantee are absolutely delicious eaten together. Apart from the regular All-Day menu items by Chef Papajoh, we will also be collaboratively launching the Nasi Jenganan Platter. 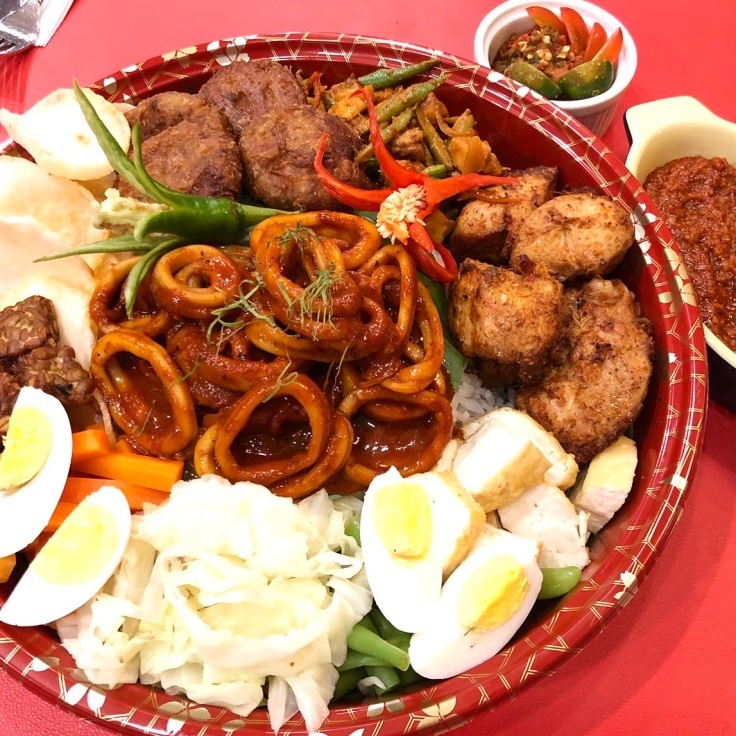 A traditional Javanese Cuisine, you will get to enjoy a total of 16 dishes and items in one platter – 10 dishes served together and an additional 6 items served as a mixed salad side. It is definitely a meal not to be missed! That’s all we have for you in this October newsletter … look out for more exciting news and updates! Use the following tag – #happinessatcucina – to be featured on our Facebook page and Instagram account!